John Blevins and Ana Gosnell at Clove & Hoof. The team behind Clove & Hoof is working on an old-fashioned soda fountain set to open in December. 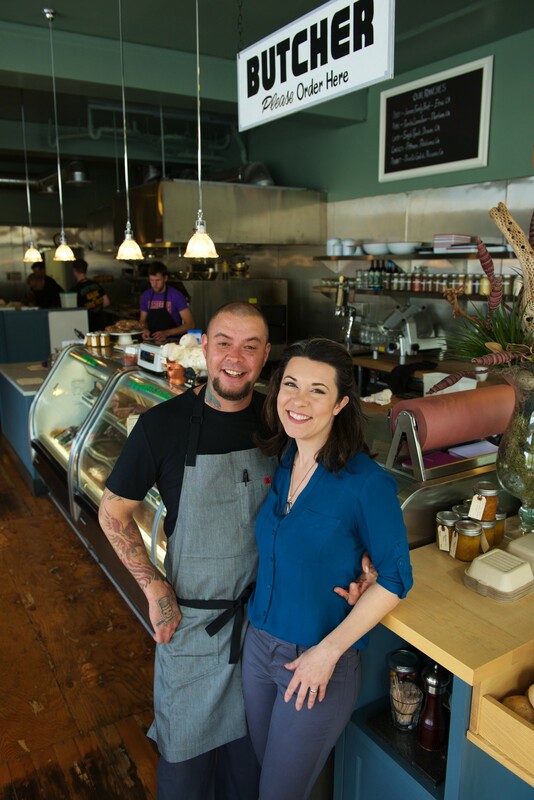 Co-owners John Blevins and Ana Gosnell will launch The Fountain (4001 Broadway) right next to their popular butcher shop in North Oakland. They plan to deck it out in retro nostalgia, from the design to the menu. Details are a little vague right now but expect milkshakes, sundaes, malts, egg creams, and sodas, with an interesting lean toward savory flavors. Sodas are currently the main focus for Blevins, who will make all the tinctures and bitters. He’s collaborating with Oakland's Five Flavors Herbs in the hopes of unveiling some hand-foraged root beer, for example. Other flavors he’s contemplating: lavender honey cream, Douglas Fir maple, and celery. The Fountain might make its own ice cream down the line, but for now, it’ll scoop Strauss. The fixins are likely where Blevins will get creative. “I like spins on classics, but you’re not gonna see a banana split,” he said. It’s a small, 700-square-foot space, which means there won’t be any seating. Instead, Blevins will perform his “alchemy” from behind a big, wraparound bar, where customers are meant to stand. The idea is that it’s relaxed and social — you can chat with Blevins like you would with a bartender mixing your craft cocktails. “It’s gonna be a super fun space — more of the same that we do at Clove & Hoof but applied to liquids,” he said. The Fountain at Clove & Hoof will be open Wed.-Mon. 11 a.m.-9 p.m. and Tue. 11 a.m.-3:30 p.m., 4001 Broadway, CloveAndHoofOakland.com.